Available in 6 colours (GREEN, BLUE, NAVY, PURPLE, BURGUNDY, ORANGE). The Club Tourer (820) comes with 3 lift out bags. Equiped with a long handle and wheels and has a front pocket to store your bowling jacket/rain gear/jumper. 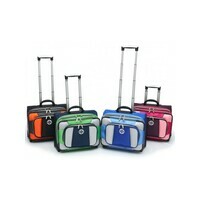 Great option if you are looking for a mid-sized trolley bag!